« Surprising Conclusions on What Motivates us at the Workplace? 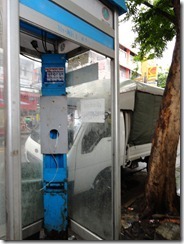 On a recent trip to Thailand, I noticed this pay phone booth on a street near the famed Grand Palace of Bangkok. If you look closely, you’ll see that the actual pay phone itself is missing. Either someone took the phone or the phone stopped working and the telco company didn’t see the need to replace it. In any case, I wonder if many people even noticed or cared if the phone was there or not. Given that a developing country like Thailand has mobile phone penetration rates near 100%, the need for public pay phones certainly doesn’t seem that high, particularly in urban areas. You see this same phenomenon in the US and Europe, with long ago installed pay phones that have little to no use. This visual scene got me to reflect on my days working at Intel in the Silicon Valley with their wireless products group in 2004- 2005. At that time, Intel along with others in the wireless industry were looking at ways to economically proliferate hotspots and help build a market for wireless devices with their silicon products. In developing countries, where wireline broadband penetration at the home was low, kick starting a mobile broadband ecosystem in economies where users could access broadband on mobile devices such as laptops or smartphones away from home was critical. Hotspots would be a critical part of that strategy. But finding available locations for the Wifi access points would require time consuming negotiation and co-ordination with different levels of governments. So, it seemed natural that the carriers would turn their existing pay phones which were increasingly sitting idle into public hotspots. Again, this was 2005, and I expected this would be common place for years to come. But it never really happened then nor become part of the mainstream in developing countries, and the US for that matter. Fast forward now to 2011, and in China, we’ve recently seen this headline:”A total of 500 public telephone booths in downtown Shanghai have been equipped with WiFi hotspots to enable the city to go wireless, bringing new life to the almost abandoned public phone booths.” Ultimately, China Telecom will look to make these phone booth hotspots also offer other services such as photo printing and access to anti-virus software and expand coverage throughout urban and suburban areas. Better late than never as they say– six years later from when I worked on strategies like this but it appears the strategy may be getting some traction. Living in Silicon Valley, you often hear about how fast it moves here. Two years can be a lifetime, often a make it or break it time frame for a startup or the beginning of a swift downfall or rapid ascension for established companies. Silicon Valley companies like Zynga have reached 100 million users for a new game in less than 60 days; unbelievable and unprecedented growth. And on the flip side, companies such as MySpace and Friendster often fall out of the collective consciousness seemingly overnight So, given all of the reinforcement of speed and pace, sometimes it’s nice to see examples of slow changes and adoption, that patience at times is an essential virtue, and concepts and products may be ahead of its time or adopted in other parts of the worlds while not sticking in Silicon Valley. The payphone as a hotspot is perhaps one such example.